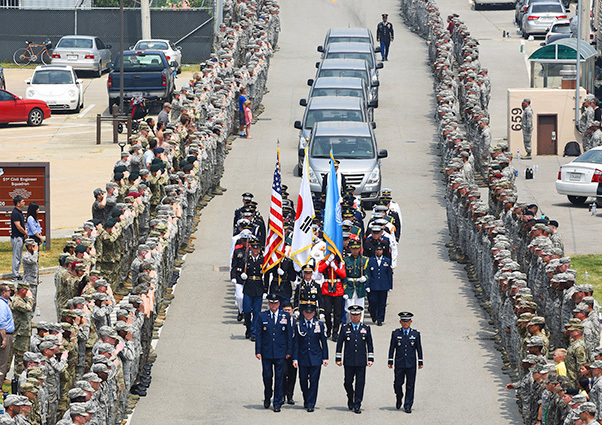 United Nations Command returned 55 cases of remains from the Democratic People’s Republic of Korea, also known as North Korea, to Osan Air Base, July 27, 2018. Members of the command and the Osan community were on hand at the arrival ceremony. When North Korea handed over 55 boxes of bones that it said are remains of American war dead, it provided a single military dog tag but no other information that could help U.S. forensics experts determine their individual identities, a U.S. defense official said July 31. The 55 boxes were handed over at Wonsan, North Korea July 27 and flown aboard a U.S. military transport plane to Osan air base in South Korea, where U.S. officials catalogued the contents. After a repatriation ceremony at Osan on Aug. 1, the remains will be flown to Hawaii where they will begin undergoing in-depth forensic analysis, in some cases using mitochondrial DNA profiles, at a Defense Department laboratory to attempt to establish individual identifications. Vice President Mike Pence, the son of a Korean War combat veteran, is scheduled to fly to Hawaii for a ceremony, which the military calls an “honorable carry ceremony,” marking the arrival of the remains on American soil at Joint Base Pearl Harbor-Hickam on Wednesday. This will mark a breakthrough in a long-stalled U.S. effort to obtain war remains from North Korea, but officials say it is unlikely to produce quick satisfaction for any of the families of the nearly 7,700 U.S. servicemen who are still listed as missing and unaccounted for from the 1950-53 Korean War. It remains unclear whether the boxes provided on July 27 include all of the bones North Korea has accumulated over the years. In the past, the North has provided bones that in some cases were not human or that were additional bones of U.S. servicemen already identified from previously recovered remains. Efforts to recover remains in North Korea have been fraught with political and other obstacles since the war ended on July 27, 1953. Between 1990 and 1994, North Korea unilaterally handed over 208 caskets to the U.S., which turned out to contain remains of far more than 208 individuals, although forensics specialists thus far have established 181 identities. In addition, a series of U.S.-North Korean recovery efforts, termed “joint field activities,” between 1996 and 2005 yielded 229 caskets of remains, of which 153 have been identified, according to the Pentagon. The Trump administration, as part of the Singapore agreement, is pursuing discussions with North Korea on resuming those “field activities,” for which past administrations have paid millions of dollars in donated vehicles, equipment, food and cash at the request of the North Koreans. The U.S. official who discussed aspects of the return of the 55 boxes on condition of anonymity said the U.S. is considering the possibility of including South Korea in future searches for remains in North Korea. It’s not clear whether negotiations for such an arrangement are under way. Downes, 70, was 3½ when his father’s B-26 Invader went down on Jan. 13, 1952, northeast of Pyongyang, the North Korean capital. His family was left to wonder about his fate. Downes, now executive director of the Coalition of Families of Korean and Cold War POW/MIAs, which advocates for remains recovery, said he hopes the boxes that arrive in Hawaii on Wednesday prove to be a vanguard that leads to a fuller accounting for families.